Menengai Cream Homeboyz ended SportPesa Quins unbeaten record with a 15-10 result in Kenya Cup match day eight action at the Jamhuri Park on Saturday 14 January 2017. 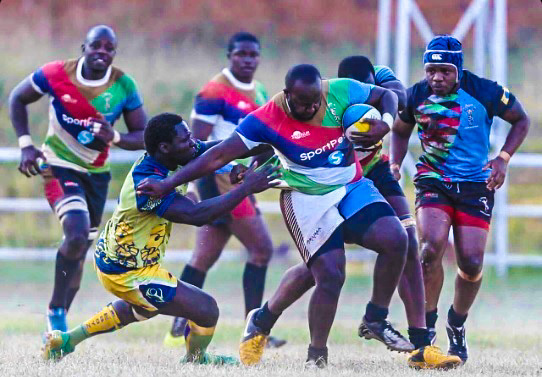 The deejays were handed the early advantage, numerically that is when Quins back row Peter Misango saw red for a dangerous tackle minutes after kick off. Powerhouse center Max Kang’eri would get the game’s first points, barging over the whitewash to put the deejays 5-0 up after 20 minutes of play. Kevin Keegan would on his second attempt, drill the ball between the sticks after Quins were awarded a penalty, cutting the deficit to 5-3 heading into the interval. Further tries from Collins Shikoli and Oscar Ayodi saw the deejays go 15-3 up before a late Quins surge saw Brian Okwomi touch down, Keegan adding the extras, too little, too late as Homeboyz ran off with the result.